Her look is so casual but chic, I think it’s inspired me to start my jumpsuit mission again! Do you wear jumpsuits? Do you ever try them with layers like Elisa? I like how they’re a whole outfit in one – the best for lazy days! J’adore les combis! j’en porte d’ailleurs une dans mon dernier look :) j’aime leur côté chic sans en faire trop! bon la version plus décontractée en denim, j’avoue que j’ai un peu du mal, il faudrait qu’elle soit parfaitement taillée! I love this look! Was lucky enough to find an amazing vintage workwear jacket just like this at Sweet Joey’s in Asbury Park, NJ. I absolutely love the idea and look of a jumpsuit, too, but…here’s a question that I never see asked or discussed: How much of a total drag is it to go to the bathroom when you wear a jumpsuit?! I mean, after my second cup of morning tea, it’s pee time and I wouldn’t have to basically completely undress every time I need to run to the loo. Thoughts? I love jumpsuits, but this is definitely an issue! Personally, I try to wear a little camisole top underneath the jumpsuit so I’m not so exposed in this situation. However, I haven’t found a way to avoid just pulling the whole thing down. Beauty is pain–or at least annoyance! Yesssss!!! I face this dilemna every time I wear my jumpsuit. It’s worse with layers because you have to take everything off and then restyle yourself before you leave the cubicle. I don’t think theres any solution about from pelvic floor exercises so you can hold it all in for just that little bit longer. Fun times. Try searching for the term “boilersuit” instead of “jumpsuit,” especially if you’re trying to purchase one online. That might help with trying to distinguish between the different fit of various jumpsuits. 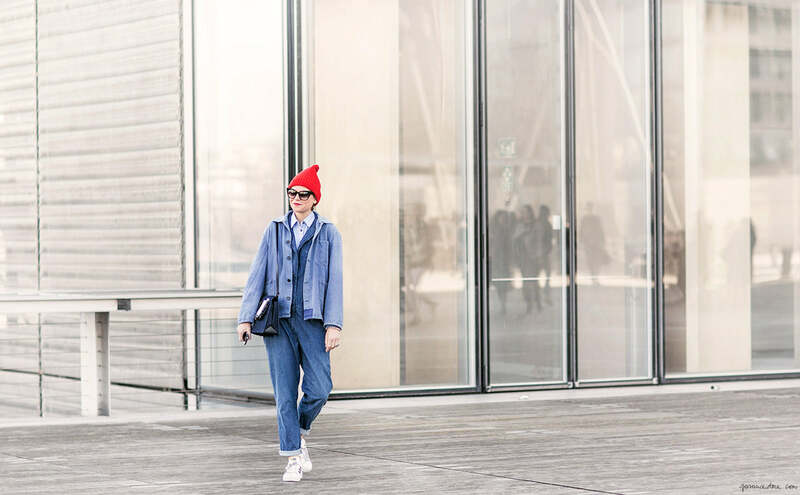 If the look you’re going for is a relaxed fit, then boilersuits might be the way to go because they tend to be more “tomboyish-looking” on women’s figures. I found a perfect form-fitting Catherine Malandrino jumpsuit a few months ago, but I’m curvy and that’s exactly the Beyonce look I was going for. To each her own! I just bought my first jumpsuit! It’s the shorts version. By Joe’s Jeans. I love it. Must just get slimmer for summer…. J’aime bien, c’est joli, mais je n’ai toujours pas compris comment on faisait pipi, surtout en hiver avec veste par dessus et tout! ça, c’est dû au bonnet rouge. La tenue parfaite pour ressembler à un mollusque en goguette. Here’s a cool jumpsuit that was found at the Salvation Army. Just to show you that you can look good for really no money at all. Pas trouvé non plus de modéle me convenant mais je ne suis pas sure d’avoir une morphologie à salopette ! Celle ci est très sympa ! I live in jumpsuits! Great for easy packing and travel. FYI – found an great denim jumpsuit at the GAP in London, was a special edition found in only certain stores and grabbed the last one in my size! Humanoid jumpsuits are the best! Extremely flattering. J’ai trouvé la mienne l’an dernier et je ne la quitte plus ! Avec des baskets ou des talons hauts, un long pull ou une petite veste cintrée… indispensable de mon dressing ! The last one I bought was at the GAP in light denim. Fabulous!!! Can’t wait for Spring to wear it! The denim jacket really helps to pull it together, otherwise it might look a bit shapeless. Sadly, I’ve never been able to wear a jump suit either, I’m too long and it’s just not a good look. Si vous voulez trouver LA vraie salopette originale, il s’agit de celle fabriquée par Adolphe Lafont, Lafont fait partie de l’histoire du vêtement de métier, ce fabricant est LA référence depuis 1896. Parti des vêtements de charpentiers, ou de tailleurs de pierres des compagnons du tour de France, il a fourni l’explosion de l’industrialisation du XIXe, jusqu’en Angleterre, et garde la paternité incontestée de l’authentique bleu de travail. Détourné très tôt par les aristocrates taillants leurs rosiers, les freaks new yorkais branchés des années 70, Sophie Marceau en salopette Lafont dans “La Boum”, ou comme Coluche sur scène, Lafont est l’heureux détenteur de patrons de coupes indémodables. Vous trouverez sur notre site, http://www.detoujours.com, la salopette et la veste de travail authentiques toujours fabriquées aujourd’hui !!!! Neada! I really like your articles! Almost as much as Garance’s ;) Tu sors du lot as we say in French !! Like you, I am still searching :) I really like jumpsuits – both as an idea and on other people. But haven’t managed to find the one for me. Yet!